Here at Global Living we want to connect with our readers — know what you’re all about, what you love, where you’ve been and where you’re going. The best way to do this? Hear it straight from YOU! 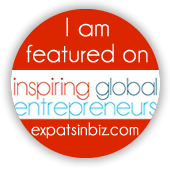 We have a ‘My Expat Story’ section of our website where we will post great expat and travel stories from you, our readers. Also: Don’t forget to include a picture of yourself, the URL for your website/blog, and your Twitter handle so we can help you connect with other expats from around the world!